Analytical Chemistry, Volume 38: Ion Exchange in Analytical Chemistry provides a broad survey of the important role that ion exchange can and should play in chemical analysis. This book focuses on the plate-equilibrium theory of chromatography, which is less difficult theoretically than the mass-transfer theory. Organized into 11 chapters, this volume begins with an overview of the earliest recorded application of ion exchange. This text then examines how high temperature affects ion-exchange resins. Other chapters consider the exchange of ions between a solid ion-exchanging material and a solution, which is a typically reversible reaction. This book describes as well the relatively simple separations and other applications of ion exchange to analytical chemistry. The final chapter deals with the interesting nature of the metal complexes formed within the exchanger and describe the use of ion-exchange distribution studies to determine the stability and nature of complexes existing in the solution. 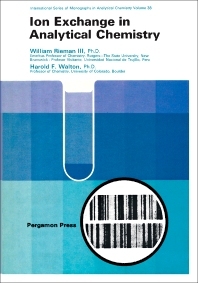 This book is a valuable resource for analytical chemists.